Shem Phillips is a game designer who is well known for his Vikings of the North Sea trilogy of games. I was able to play Raiders of the North Sea, which was nominated for the Spiel des Jahres. I really enjoyed the theme and unique take of worker placement here. Finding specific workers for different locations, and then also putting down a worker and picking up a different one added something new to consider while playing. Raiders of the North Sea is so good that it automatically vaulted into my personal top 10 favorite games of all time! 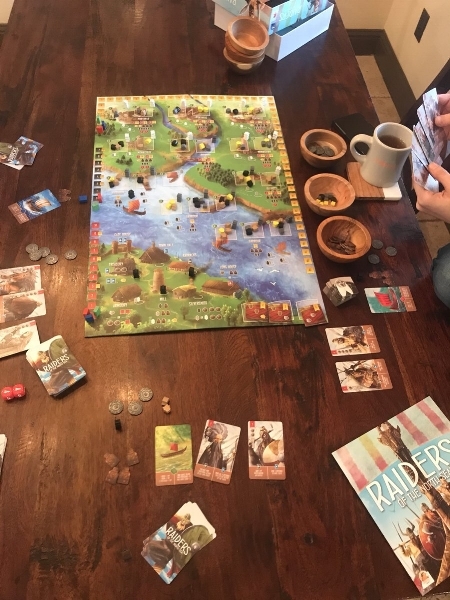 I was able to interview Shem who gave us some insights into his design process, as well as his new trilogy of games, set in the West Frankish kingdom. Below is our 13 Questions with Shem Phillips. The main inspiration is often other games – digital and tabletop. I played (and still play) a lot of Age of Empires II on PC. This has been a big influence on all my recent medieval games. I use Google Drive for all my ideas. I have a Google Doc with a bunch of concepts – single paragraph kind of stuff. I also use Google Sheets when working on prototypes. Sometimes I will end up using Adobe Illustrator to jot down ideas, since it's easy to have graphics and text all in one place. This can help when trying to visualize the game on a table. 3. When did you know that the trilogy of Viking games would be something special? After the unexpected success of Shipwrights on Kickstarter, I knew I was onto something good. The Mico (artist) started growing quickly in popularity. There was a lot of demand for a follow up game, and so Raiders was born. I've always been creating. My brother and I use to design our own superheroes and other characters when we were very young. I started song writing when I was about 9 years old. In the past I've also designed websites, t-shirts, logos and various other things. I grew up playing a lot of the classic American games, but only discovered modern games in my early twenties. Being a creative junkie, I dove straight into designing my own. Trying to force creativity has never worked for me. I find I'm most creative away from my computer. Laying in bed early in the morning, thinking about new ideas is a common thing for me. 7. What gives you the greatest satisfaction from designing your games? There's a few things. I love when artists send me new files during development. Seeing others enjoy my games and discovering hidden depth within each game – that never gets old. I also really enjoy getting the finished print copy in my hands for the first time. 8. What does your design process look like? Stare at computer. Read old notes. Give up. Play some Age of Empires II. Play a prototype. Give up. Go to sleep and think over new ideas. Give up on sleeping – get up and 4am to work on my new ideas. Rinse and repeat! Not sure that counts as a process? 9. What physical pieces do you use most when designing or prototyping a game? Card sleeves, coloured cubes and meeples. Board games (surprise, surprise). I have some figurines from Final Fantasy and Lord of the Rings. I collect dice too. 11. Is there somewhere you would like to travel that you haven't been to yet? Egypt, France, Italy, New York in Christmas. 12. What game designers are you a fan of? The Brunos – Cathala and Faidutti. Stefan Feld, Matt Leacock, Vlaada Chvátil. 13a. What games are you currently playing the most? Other than prototypes, Scythe, Sagrada, Kingdomino, Pandemic (in various forms), By Order of the Queen. Dead of Winter. 13b. Any hint or ideas of something new you are creating next? Architects of the West Kingdom will be my next release. As you might guess, it's part 1 in the start of a new trilogy, set in the West Frankish kingdom. This game is also my first co-design. It's been a really great experience working with a good friend. Thanks Shem for the interview!